Zazzee Naturals Organic Milk Thistle provides 7500 mg strength per capsule, contains up to a 4-month supply, and is Certified USDA Organic -- a value like no other product! Enjoy the benefits of a potent, premium-grade Certified Organic Milk Thistle supplement - at a very affordable price! OUTSTANDING VALUE: Our Organic Milk Thistle contains 7500 mg strength per capsule AND 120 capsules per bottle - an amazing value! A single bottle contains up to a 4-month supply. 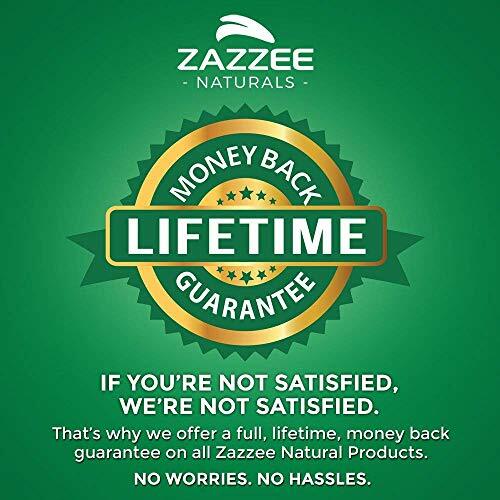 Compare this to other leading brands that require 2 capsules per serving, do not provide a 7500 mg strength dosage, and are not Certified USDA Organic. Our Organic Milk Thistle is a bargain not be found elsewhere! 30:1 EXTRACT FOR MAXIMUM STRENGTH DOSAGE: Our Organic Milk Thistle is made from a potent, concentrated 30:1 extract. A 30:1 extract means that the herb itself has been condensed, so that 30 grams of the original herb are concentrated into a single gram. By using a 30:1 extract, we have created a powerful supplement that is 30X stronger than standard Milk Thistle capsules. 80% SILYMARIN FLAVONOIDS: The "good stuff" in Milk Thistle is called Silymarin Flavonoids. The more Silymarin Flavonoids, the better the Milk Thistle! Our Organic Milk Thistle has been standardized to 80% Silymarin Flavonoids, which means that each capsules contains 200 mg of Silymarin Flavonoids from a 30:1 extract - the highest dosage available! 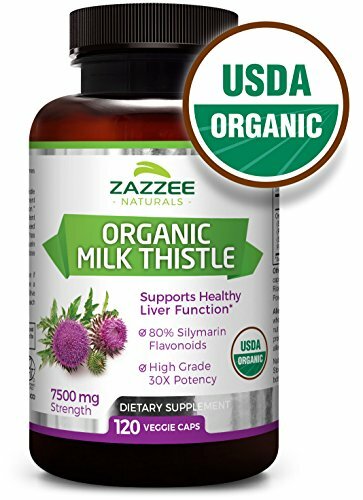 USDA CERTIFIED ORGANIC: Any Milk Thistle that is not CERTIFIED organic can be highly contaminated and even toxic to your liver. 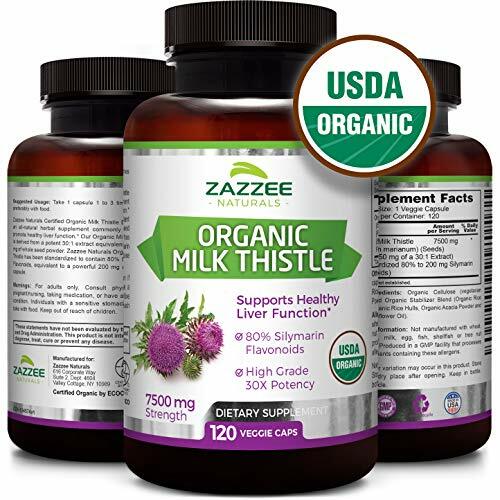 With Zazzee Naturals Certified Organic Milk Thistle, you can be sure your Milk Thistle is organic, all-natural, vegan, and non-GMO. More, while other competing products use various chemicals as fillers, binders, and excipients, our Organic Milk Thistle instead uses a unique Organic Stabilizer Blend. GOLD STANDARD PRODUCTION: Your health and safety mean everything to us. 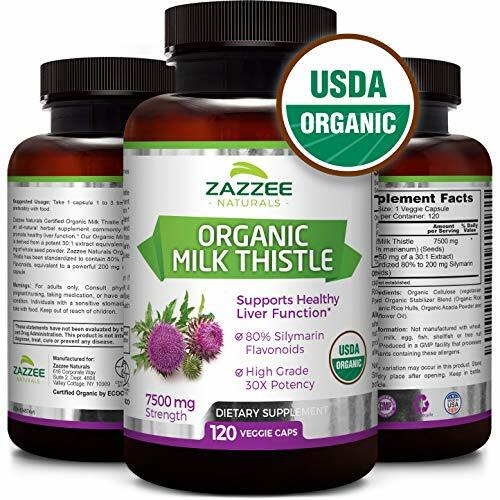 For that reason, our Organic Milk Thistle is manufactured in the USA, in an FDA certified facility with adherence to good manufacturing policies and under the most stringent quality control. You can rest assured that you get the best value for your money!